Lola, Anita and Ifeoma: Meet The Three Wives Of The Psquare Dynasty. HomeEntertainmentLola, Anita and Ifeoma: Meet The Three Wives Of The Psquare Dynasty. While the Okoye brothers fight it out, their wives are staying away from the fray. It only took a cyptic shot by Paul Okoye which alluded to an unknown woman ‘trying to destroy’ brothers before fans suspected he may have been referring to his twin’s wife. Peter on the other hand has made it clear that his nuclear family comes before anything and is fearful for his life as his elder brother Jude had threatened to shoot his wife in the past. While the Okoye brothers fight it out, their wives are staying away from the fray. But that is not to say the women are unimportant: all three exert a certain level of influence on their husbands. 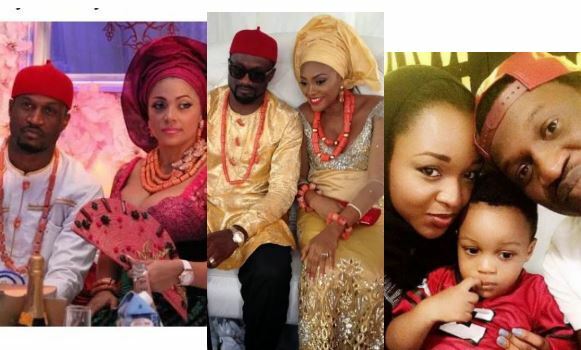 Here’s a quick look at the women that make up the warring Psquare dynasty. The oldest of the Okoye wives, the former Miss Omotayo met Peter in Enugu and had been with him for quite a while. The couple welcomed their first child Cameron in 2008 before eventually getting married in an elaborate wedding in November 2013. Lola who met Peter when the Psquare duo were just starting out in the industry, once disclosed the reason she stuck with Peter through the years. ‘When I met my husband, people were like what are you doing with him, he has nothing but I stood my ground and chose to stick with him because he had a dream. He and his twin brother did not let their dream die, they worked hard, look at them today! I stuck by him because he had focus and drive and today I am happy, I have a good life, we are happy and we have got a beautiful family’. Lola has been the scapegoat of the Psqaure beef since it started with rumours of the twins’ late mother’s refusal to accept a ‘Yoruba’ wife. Peter on his part insists that she’s the love of his life and nothing can change that. Anita is a lawyer and the wife of Paul Okoye. Unlike Lola who is quite visible, Anita seems not to particularly care for the exposure that come’s with being a Psqaure wife. She and Paul met while she was a student at the University of Abuja and were together for nearly a decade before signing the dotted lines. They welcomed their first son on 11th of April 2013 in the United States and later had their court wedding in Lagos on January 22, 2015. When she gave birth to a set of twins in July 2017, her husband pointed fingers at some people who he said were not happy for him. Curiously, there was no congratulatory posts by his twin brother, leading fans to believe that all was not right. She may be the youngest but Ifeoma is the wife of the eldest Okoye brother, Jude. On Monday, she delivered the couple’s second daughter in the United States; having been married to Jude since July 2014. The former model and beauty queen studied Industrial Chemistry at the University of Port Harcourt and doubles as Paul Okoye’s talent manager. She is also a brand ambassador of various beauty brands and runs a philanthropy project called the Cash Apple project.